For the longest time I have wanted to paint our kitchen white and it finally happened. Today I am giving you my friends a tour of the room where life happens. It looks different… doesn’t it? This next picture was taken around 5:30 pm… my favorite new hour of the day! The sunshine comes right through the window and it makes me so happy! My favorite part of the kitchen has to be the white cabinets. I took this picture even before we were done adding the handles to all of the doors and I could not believe what those bright clean cabinets had done for the kitchen already. I wanted to keep the space really neutral since I love to decorate for every season and holiday. Changing accessories will be really easy to do with a neutral background. With Spring here and Summer knocking on the door in just a few months, color was a must. I love the old country vintage style as much as I love the modern retro feel so I mixed both. 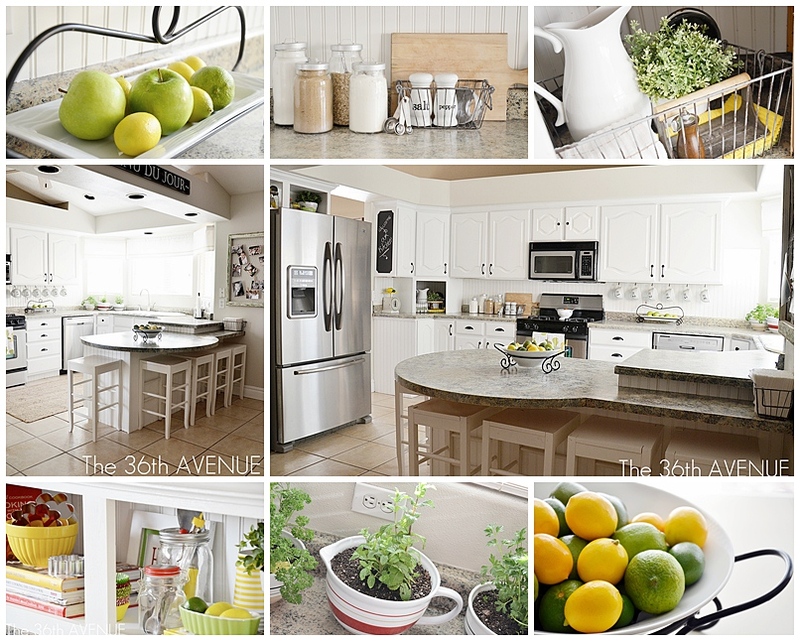 I chose red, yellow and green around the kitchen with little accents popping here and there all over the place. You can see the TUTORIAL of it here. Another element found and used around my kitchen was vinyl. The number mugs, the salt and pepper shakers, the vinyl chalkboard and the “Menu” Sign on the bridge. My favorite of all four vinyl projects has to be the mugs. I love the fact that they are washable… we use them to eat soup all the time. 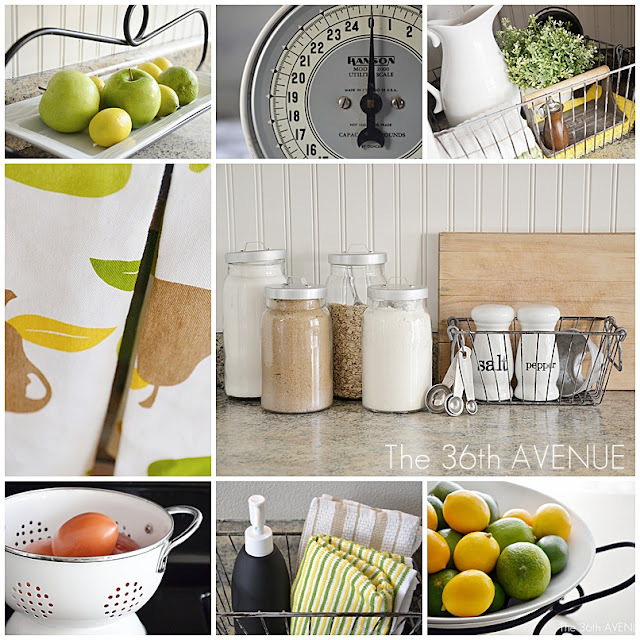 You can see how to make your own stenciled washable dishes HERE. I always have wanted to have a herb little garden, however the summers down here are extremely hot and most herbs don’t do well in such weather. Last week I took my little ones to our beautiful local nursery and I learned that if they are by a window they do really well indoors. 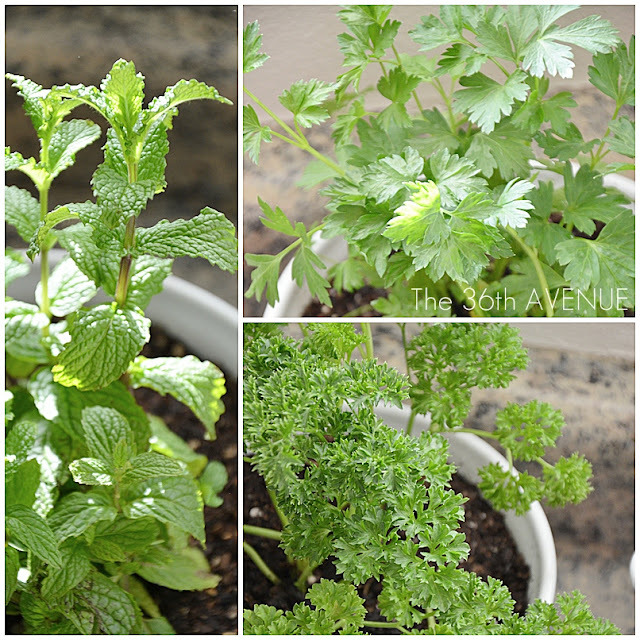 So I made my little garden and let me tell you that mint smells so darn good! Other sweet little thing was the Washi Tape Window Treatmet. I shared the TUTORIAL just a few days ago. This was super easy to make and I love how bright the natural light comes through it! The last sweet little thing I am going to share is the Old Window Kitchen Wire Frame. 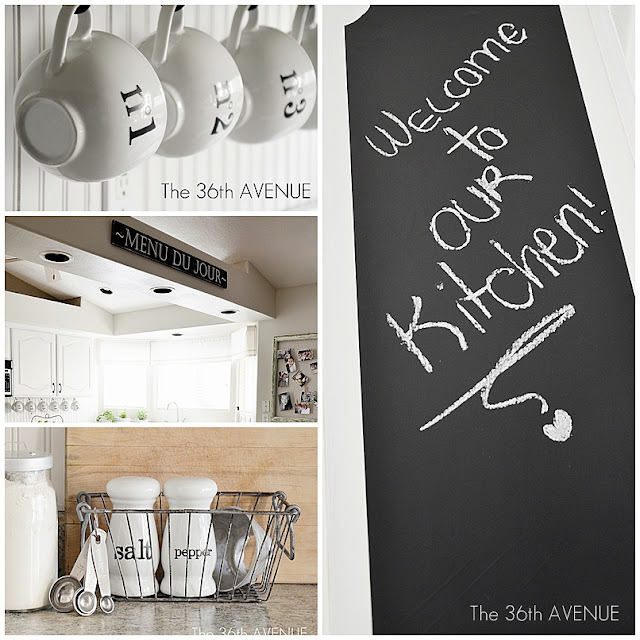 What a simple way to display pictures, notes and… sweet little things. A great simple way to bring texture and dimension to your wall is by using bead board. We used the beadboard around the island and also as a backsplash. Another “home improvement” project that we did was changing the faucet. 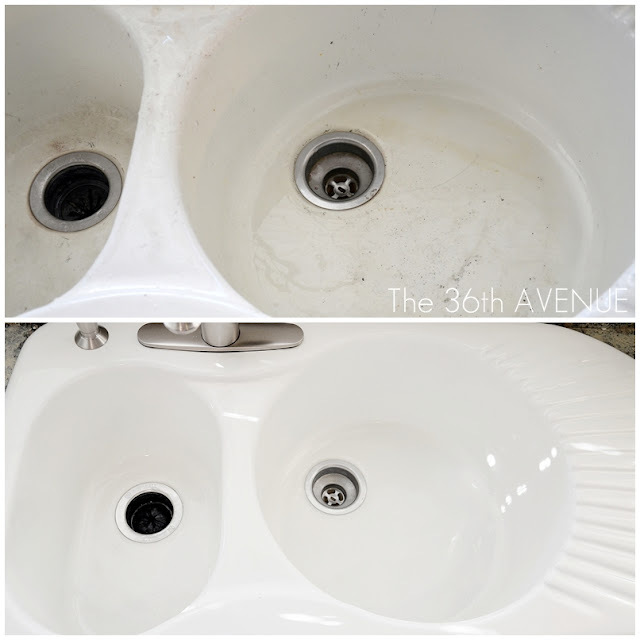 …and what an amazing transformation cleaning the porcelain sink made. 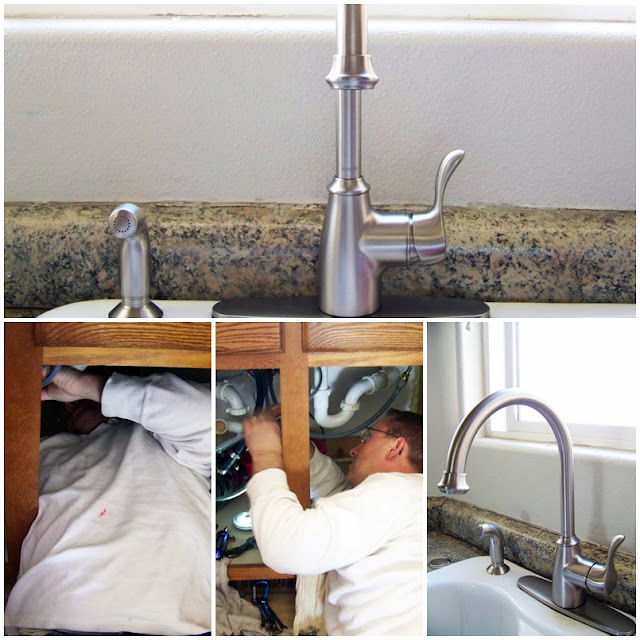 You can see the tutorial of how TO CLEAN YOUR own PORCELAIN SINK here. However what started the kitchen makeover fever were the counter-tops. If you have never seen the before pictures I am warning you they were bad! I can’t thank Giani Granite enough for making such an EXTRAORDINARY product. I still can’t believe that a “paint” could make such a transformation. Click here to learn more about their products! So there you have it… from old to new. I hope you like our kitchen as much as we do! if you are on my main page! 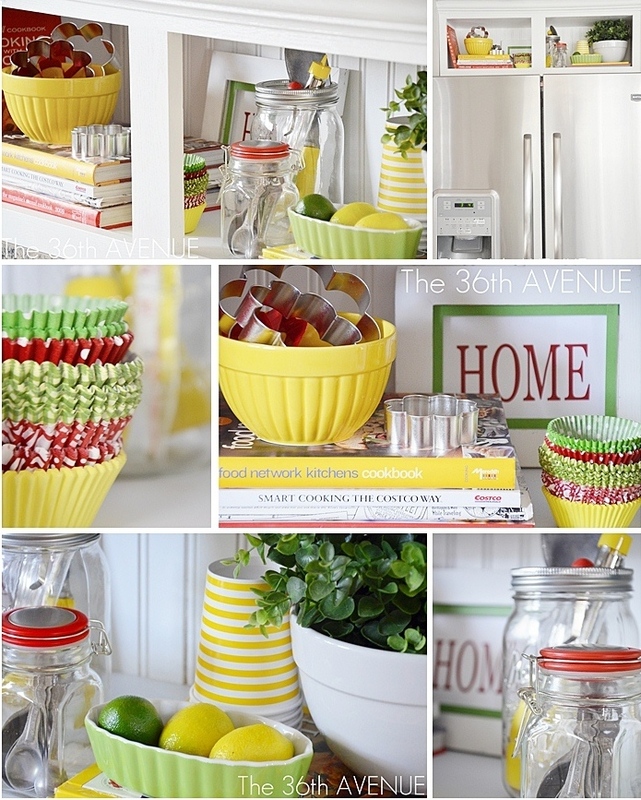 PreviousKitchen Accent Cabinet Tutorial and Party! Hi! Your kitchen is absolutely beautiful! I would love to convince my husband to do this with ours. 🙂 Would you be able to tell me where you got your white seving bowl and plate with the black stands that hold your fruit? They are awesome! 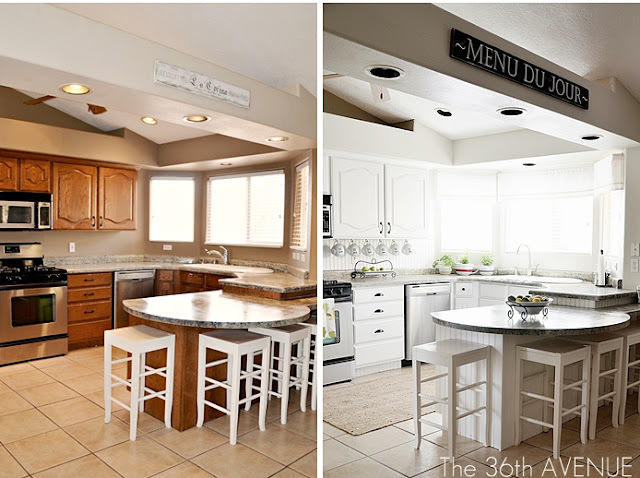 What paint color did you use for you kitchen? I love it! Jana, the cabinets or the walls? Desiree, how have you countertops help up? 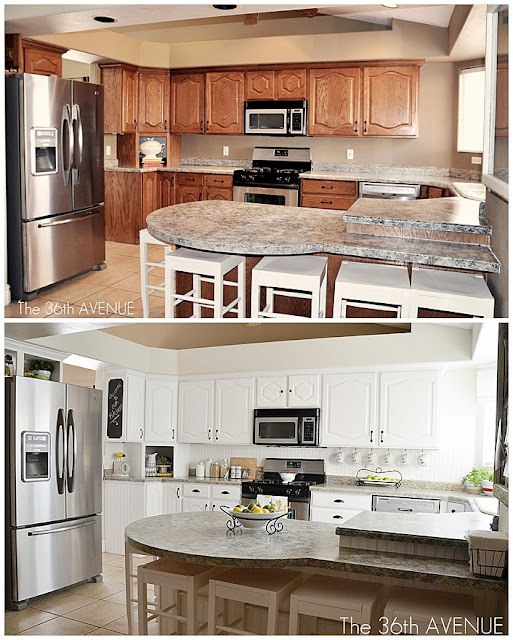 My husband and I are starting a big house update and I would really like to change our kitchen countertops out, just don’t have the budget to do so. My husband is very, very skeptical about painting the counters though. How have they held up for you against water, heat, cleaning, etc? I love your kitchen. I too have redone my kitchen and also used Giani Granite for the countertops. I love this product. Everyone that comes over can’t believe I painted them. 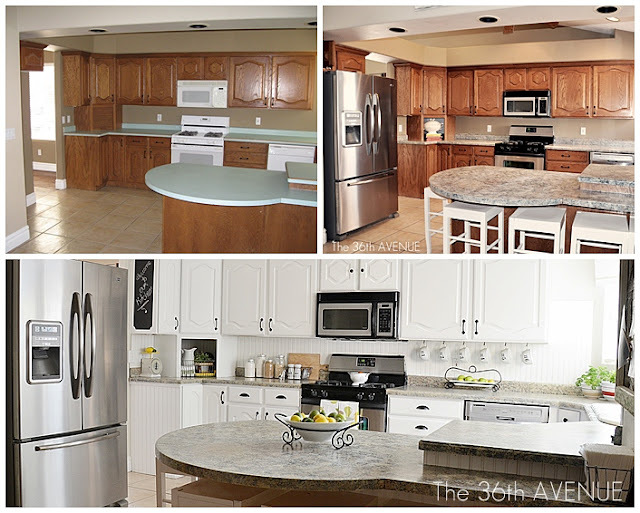 Enjoy your new kitchen! Beautiful! I love a white kitchen and yours is stunning. Such a testament to how much light it lets in and I love the pops of color in the accessories.